We don't even see your credit card number because we only accept payments via PayPal which keeps your data safe. All letters, emails, and communications from anyone become property of this institute and can be used for marketing purposes. We regularly update and improve the products and the cover design and content may change without notice. All our products are for educational purposes only, there are no medical or other claims being made or implied. If you do not like or feel good with any music, exercises, or techniques, then you must stop their use immediately. Prices in US $ are for people from outside India, who want to order for delivery in India to relatives/friends or to outside India. Money Back guarantee is available only for payments received from India in Indian Rupees only. Memory MapsTM, Memory CourseTM, Bapna's Will/Shall RuleTM are trademarks. Published by Raj Bapna and Anil Bapna, Udaipur. All matters subject to jurisdiction of Consumer Forum / Courts in Udaipur (Raj), India only and no other. Seller/ publisher/ manufacturers liability limited to price of product only. It is so hard to trust companies on the Internet nowadays. Companies can simply disappear. How can I trust you? Answer: Some skepticism is good in modern world. 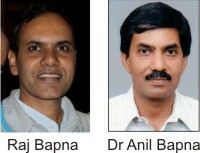 We brothers (Dr Anil Bapna and Raj Bapna) have been helping students since 1991 (that is almost for 20 years now). Our full page advertisements have appeared in EACH and EVERY month in India's number 1 English monthly magazines Competition Success Review and General Knowledge Today . So you can order confidently knowing that we have been working for almost 2 decades now. You can buy a copy of the magazine or check any old issue to confirm this. If you are curious, above are our photos that you might have seen in the magazines. Thousands and thousands of students like you are using our research-based, tested-and-proven courses, CDs. Many working professionals and famous people also use our products to use more mind power for their learning, intelligence, stress management, and success.